On a parchment-lined sheet pan, to one side, place the spring peas and snap peas. Pat the salmon dry and brush liberally with the marinade on both sides. Season with salt and pepper and a little fresh orange zest. Drizzle the remaining marinade over the peas and give a quick toss. Bake 10-15, or until desired doneness, keeping in mind thicker cuts of salmon will take longer, thinner cuts shorter. 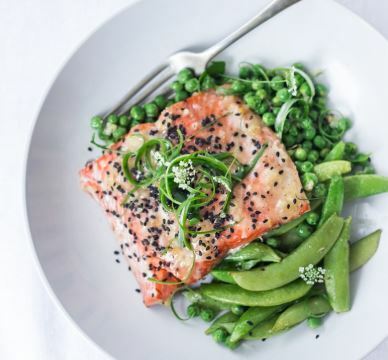 Divide both peas among two bowls, top each with a piece of salmon. Garnish with scallions & sesame seeds.